1. I visited a total of 19 state countries (17 sovereign, 2 observer), in which the majority has a very developed economy. Thus, high budget is required for any tourist visitors. 2. I went back to my homeland for four times. 3. Despite of the unmanageable difficult bosses and enormous ups and downs at work, I still pursued to continue itinerary planning. Output was very far than I expected. 4. Conquered the world's most strict airport security on my own, highest summit reached at 4,095.2 meters and lowest place on Earth at -394.5 meters. 5. For a budget Filipino solo backpacker, I consider all places I visited in 2013 as impossible dream destination (Great Wall, Mt. 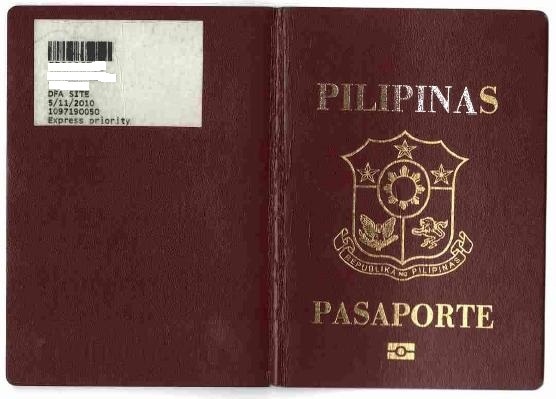 Kinabalu, Japanese Castles, Eiffel Tower, Neuschwanstein Castle, Leaning Tower of Pisa, St. Peter's Basilica, Jerusalem, Dead Sea floating, etc). Imagine as a corporate slave forcing myself to ask and spend my LEGAL vacation leave while practicing the enormous budget planning. I ranked these posts based on the adventure i have encountered, budget and how happy and satisfied i am through the planning, journey and the outcome. - this trip is astonishing because Mt. Kinabalu (4,095m) is 38.63% (1,141m) higher than Mt. Apo (2,954m), tallest mountain in the Philippines and 116.07% (4,753m) lower than Mt. Everest (8,848m), tallest mountain in the world. Indeed an incredibly rewarding! - this trip is astonishing because we all know that this country is one of the most influential European nations culturally, and main economic powers because of their high-precision technology and main contribution in World War II. - this trip is astonishing because I thought I could not do it, I thought it was just a dream, I thought it was just in the books and featured in movies. Stunning ancient architectures from the Angkor Wat, to Temple of Jupiter to Great Pyramids and now to Great Wall. - this trip is astonishing because this was my first trip abroad with my family. Seeing them enjoying the famous tourist spots of this places especially the fireworks of Disneyland makes me realize its priceless to share the dream with the ones we love. - this trip is astonishing because of unimaginable reality that I saw with my naked eyes the majestic Swiss Alps during flight cruise from Rome to Paris and from the 7,000 ft summit of Mt. Pilatus. - this trip is astonishing because we all know that Japan has a very rich cultural history that's why this was tagged as "the country where the past meets the future." Experiencing also the shinkansen "bullet train" while sightseeing the countryside is one of the most unforgettable experience I ever had. - this trip is astonishing because France is a very developed country, the wealthiest nation in Europe and 4th in the world. French citizens enjoy a high standard of living, high public education level, and one of the world's longest life expectancies. In addition, the very famous world renowned timeless signature landmark Eiffel tower. - this trip is astonishing because Italy is acknowledged as the birthplace of Western culture where high art and monuments are to be found everywhere around the country. It is also famous worldwide for its delicious cuisine, its trendy fashions, luxury sports cars and motorcycles, diverse regional cultures and dialects, as well as for its many beautiful coasts, alpine lakes and mountains (the Alps and Apennines). No wonder it is often nicknamed Il Bel Paese (The Beautiful Country). - this trip is astonishing because Israel is the world's only Jewish-majority state and considered part of the Holy Land. Israel has been called the Promised Land because God promised Israel to the children of Abraham through Isaac, as the Old Testament states "And I will give to you and to your descendants after you, the land of your temporary residence, all the land of Canaan as an eternal possession and I will be a God to them." 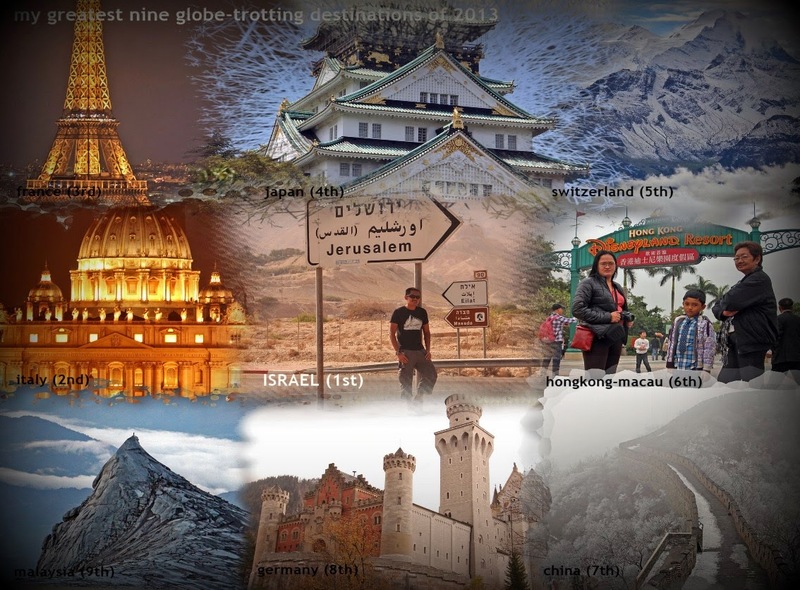 Aside from this unimaginable travels, 2013 is one of the blessed years I ever had. Among to these achievements are passing the IELTS general exam, progressive work in Middle East, and mostly, bought my own house.